The Buck 112 Ranger already was a sound knife design for anyone who needs a rugged blade for hard everyday use -- and a dependable hunting or fishing knife for that impromptu getaway. In fact, I was skeptical of the changes that created the Buck 112FG -- it's not usually smart to mess with the details of something that's already good. I'm glad to see that the changes are sensible, in keeping with the character of this well-known Buck folding hunter. 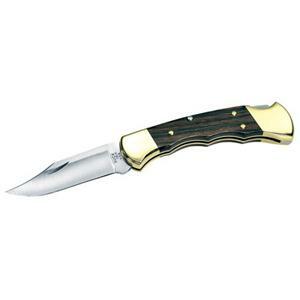 In the Buck 112FG Ranger, you'll find the same excellent knife with a 3-inch-long 420HC high carbon stainless steel blade, easy to sharpen and tough to break. The opening system requires two hands, one to hold the knife and a spare thumb to catch the notch in the blade. Lockback is secure and definitely enough for safe work, but releases easily with finger pressure -- again, a two-handed task. Rosewood and brass are the usual handle materials, a combination that is both serviceable and beautiful. It even holds up to abuse, so don't worry about treating it roughly. Rub a little oil on the wood now and then when you clean the liner or sharpen the blade. The improvement really is something better, not just something trendy. Four finger notches sculpted into the bolsters and handle increase the security of the knife's already comfortable grip. For a pocket knife, it's a little bit large and heavy -- the belt sheath is a welcome extra touch.